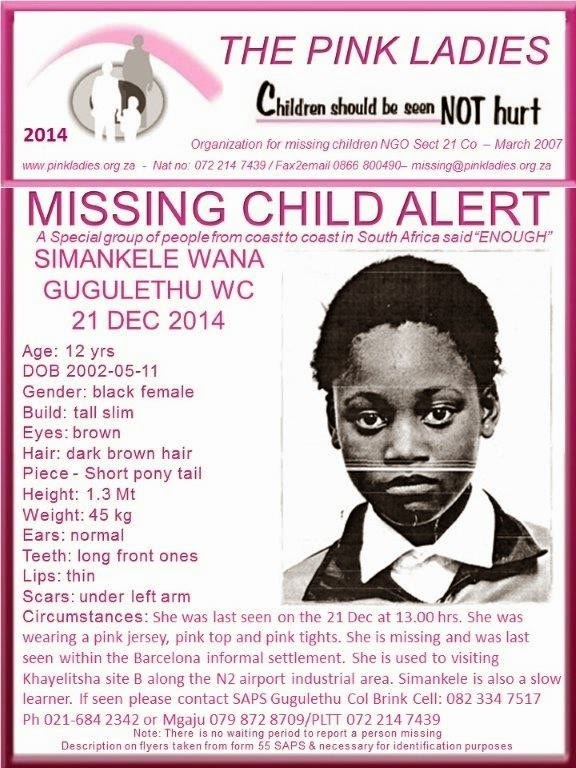 A thirteen year old form Cape Town, Simamkele Wana has gone missing. 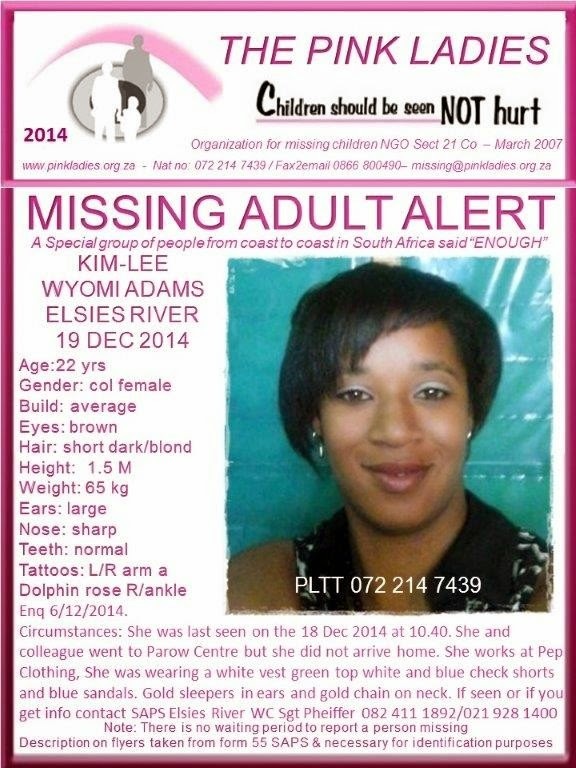 Wana was last seen on the 21st of December while walking her dogs on a field near the N2 in Gugulethu. 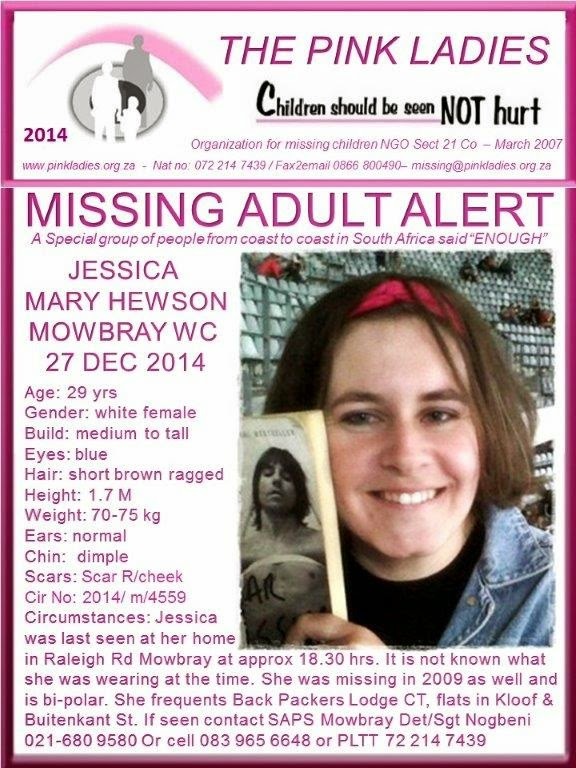 She was last seen wearing a pink jersey,pink top and pink tights. 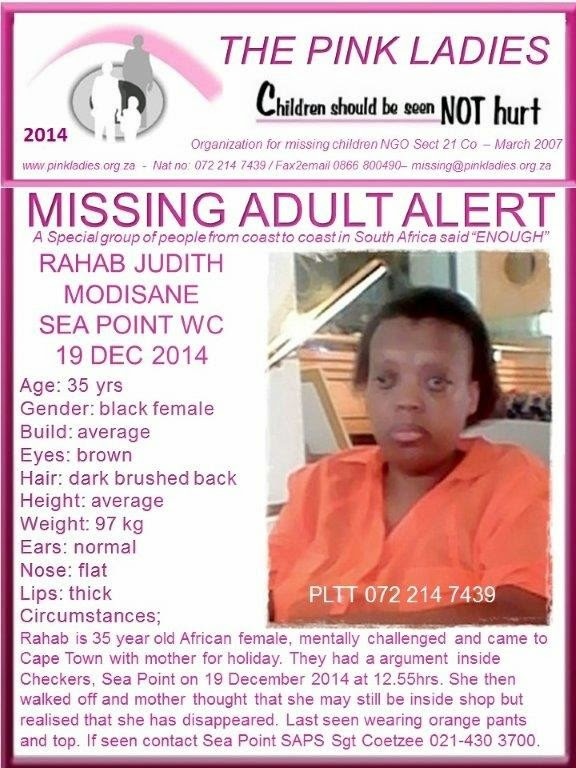 Her family have spent the rfestive season looking for her,she is said to have a learning problem. 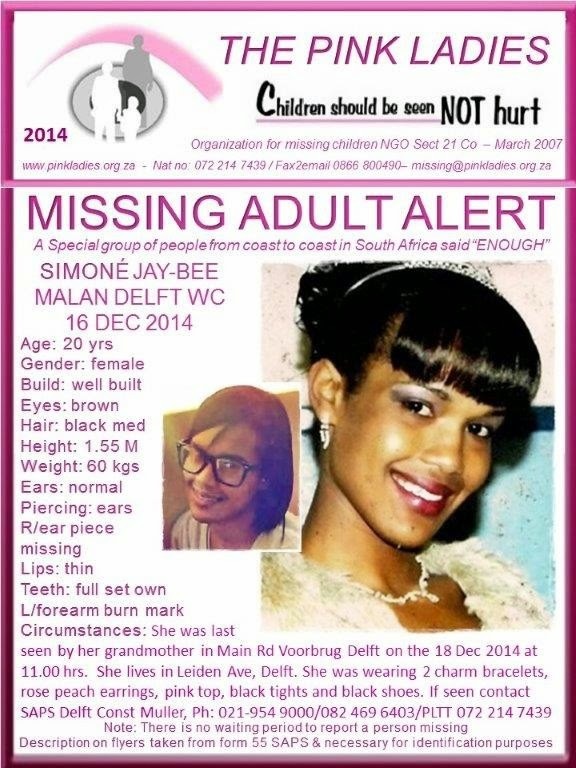 Police and proactive local NGO, the Pink Ladies, who assist police in searching for missing children, have issued pamphlets asking for any information to help find her. Simankele’s cousin Yakhanani Qokolisa, said he was playing soccer with his friends when he last saw her walking across a field with her dogs toward Barcelona. When the Cape Argus visited the area on Tuesday, her aunt Boniswa Qokolisa said the teenager’s sudden disappearance has her relatives “very worried”. The DA is calling on Health Minister Dr Aaron Motsoaledi to take urgent remedial action to clear the backlog in blood alcohol and toxicology samples at the 3 forensic chemical laboratories in Cape Town, Johannesburg and Pretoria. DA Minister of Health Dr Wilmot James says there are not enough machines to do the toxicology test. He further suggested the Health Minister should take urgent action to provide the necessary resources. Wilmot also elaborated that this would clear the accumulated backlog in blood alcohol and toxicology samples. A 29-year-old man appeared in Taung Magistrates’ Court for the alleged murder of his 5-year-old son, Remoratile Sehemo. The accused Boitumelo Seoposengwe was remanded in custody until Monday, 5 January 2015 for a bail application. Police Colonel Sabata Makgwabone said It is alleged that the suspect locked himself and his son inside one of the back rooms at his grandmother‘s place. Makgwabone said according to the information, a few minutes later, one of the children went to knock at the room where the suspect and his son were. Seemingly, there was no response and family members were alerted. Makgwabone said it is alleged that they peeped through the window and saw the boy hanging from the roof rafters. The boy’s father allegedly opened the door and ran away. Makgwabone said the police were summoned to the scene where they found the boy’s body inside the room. Makgwabone said the suspect came back later and handed himself to the police who were busy working at the scene.“The motive of the incident is still unknown and investigation continues Makgwabone added. A 24-year-old man was injured after he was apparently knocked down by two vehicles on the N2 heading north between Spaghetti Junction and Umgeni Road in KwaZulu-Natal earlier today. ER24 Spokesperson Chitra Bodasing said paramedics arrived on scene and found the man in the fast lane of the highway. Bodasing said it is understood he tried to escape during an attempted hijacking on the highway. Bodasing said he left the vehicle and ran across the highway. Bodasing said he tripped and fell on the road. Bodasing said he sustained fractures and abrasions after being knocked by the vehicles. Bodasing said he was treated and transported to King Edward Hospital. “Local authorities were on scene Bodasing added. A man believed to be in his forties was found floating in the Nkandu River, Newcastle, this evening. It is understood that a group of people living under a bridge next to the Nkandu River noticed the man floating in the river and removed the body from it. ER24 Spokesperson Werner Vermaak said Paramedics that arrived on site found that he was already dead and there was nothing that they could do for him. “He was declared dead on the scene and handed over to the local authorities Vermaak added. Eastern Cape Sgt Zono was shot and killed when en-route to report for duty on Christmas day. When he decided to enter a shop in Main Street, Qumbu a robbery was in progress. The suspects are set to appear in the Qumbu Magistrate court today on charges of murder. The Police’s Cynthia Nkamba said The SAPS Management in the Eastern Cape expressed their deepest condolences to the family, friends and colleagues of the late Sergeant Solomzi Zono stationed at the Qumbu SAPS. Lt General Celiwe Binta said their hearts go out to his loved ones and close colleagues during this difficult time. Nkamba said it is alleged that Sgt Zono was en-route to report for duty on 25 December 2014 at about 15:00, when he decided to enter a shop in Main Street, Qumbu. Nkamba said a robbery was in progress at the shop and he was shot in the upper body during the incident. 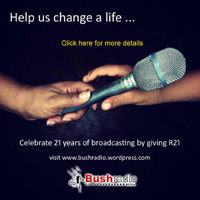 Nkamba said he later succumbed to his wounds at a hospital in Mthatha. Sgt Zono joined the SAPS in 1993 and was attached to Crime Prevention, Qumbu SAPS. Nkamba said two suspects, aged 23 and 24 were arrested on 28 December 2014. “The suspects are appearing at the Qumbu Magistrates Court today on charges of murder, attempted murder and business robbery Nkamba added. Two people died and several others were injured when a taxi driver apparently lost control of the vehicle on the R40 just outside Barberton last night. ER24 Spokesperson Chitra Bodasing said paramedics arrived at Saddleback Pass and found the taxi between 200 to 300 metres down an embankment. The taxi was found between two slopes. Bodasing said two people were declared dead and one person was found in a critical condition. Bodasing said two people sustained moderate injuries. Bodasing said it is believed that they were ejected from the vehicle. Bodasing said they were found on the slope about 100 metres between the road and taxi. Bodasing said the taxi driver and five other patients sustained minor injuries. Bodasing said patients were treated on scene and transported to a local hospital. Bodasing said the exact cause of the collision is unknown. A man in his thirties tragically died while two others escaped with minor injuries after an eight ton truck overturned along the R102 between the Ottawa and Verulam traffic lights this morning just after 04h00. Reports from the scene indicates that the truck was traveling towards Verulam when the vehicles veered across the roadway went through the barriers and overturned, its crumpled remains coming to rest on its side. Netcare 911 Spokesperson Chris Botha said advanced life support paramedics and the ambulance crew arrived at the scene and found that a man had been ejected from the vehicle and was trapped under the wreckage with life threatening injuries, the two other passengers from the truck was found at the side of the roadway with minor injuries. “Paramedics and the fire department worked fervently to extricate and stabilise the injured man from beneath the vehicle, tragically though he died on scene due to the extensive injuries that he sustained, the other patients were transported to a nearby hospital for the care that they required Botha added. Police in Mahikeng are investigating cases of murder and inquest after a 31-year-old woman and a 30-year-old man were found dead inside the house at Extension 38, Mahikeng on Sunday, 28 December 2014 at approximately 10:00am. Police colonel Sabata Mokgwabone said the police were called to the scene after a friend visited the couple and discovered that they were dead. Mokgwabone said according to the information available at this stage, it appears that the friend’s visit was prompted by the couple’s failure to answer their cellphones. Mokgwabone said it is alleged the woman was found lying dead with bruises on the face while the man was found hanging dead on the roof rafters. Mokgwabone said at this stage, the motive of the incident is unknown, and it is suspected that the man killed the woman, then hanged himself. “A suicide note was found on the scene, and investigation into the matter continues Mokgwabone added. Twelve people were injured after two vehicles and a minibus were involved in an accident on the N12 from Klerksdorp to Stilfontein this morning. Netcare 911 Spokesperson Santi Steinmann said paramedics and other services arrived at the scene and found that a minibus had left the roadway and crashed against a wall. Steinmann said reports from the scene indicate that one motor vehicle was towing another when one of the vehicles collided with the minibus. Steinmann said upon assessment of all the occupants from all three vehicles they found that twelve people sustained injuries ranging from moderate to serious. Steinmann said all the injured patients were treated on scene and transported to hospital for further medical care. “Exact detail surrounding the cause of the accident and preceding events are unknown at this stage and will remain the subject of a police investigation Steinmann added. The civil organization, Afriforum has introduced a 24-hour crisis line where the organization’s members and their families can report crime, other emergencies and request emergency assistance telephonically. CEO of AfrForum Kallie Kriel said the organization launched this service for its members in view of the growing crime crisis in the country. Kriel said his organisation decided to launch this service, named AfriForum 911, for its members in view of the growing crime crisis in the country and the fact that the police are often slow to react in emergency situations. “Where the government fails in its basic responsibilities to ensure citizens’ safety, we have to do all we can ourselves to ensure our members’ safety Kriel added. DA call on Health Minister Aaron Motsoaledi, to take emergency measures to speed-up the processing of blood alcohol samples so that drunk driving offenders can be efficiently prosecuted and justice served. The DA said it is shocked to receive the most recent figures from the Pretoria and Johannesburg Health Department's forensic chemical laboratories. DA Shadow Minister of Health Dr Wilmot James said this is extraordinary, given that all of the FCL labs had increased staffing to speed up the processing of samples, which only the Cape Town lab managed to do. James said something is therefore very wrong in Johannesburg and Pretoria. James said to run a proper lab at maximum efficiency requires brains, technology and systems. James said Minister Motsoaledi, who has till now remained silent on this issue, must take the necessary actions to help solve the problem. “Only he has the power and the budget to fix the labs and he must do so now James added. Ten people were injured this afternoon when a van and truck collided on the N1 near the Klapmuts turn off in Klapmuts, Western Cape. ER24 Spokesperson Russel Meiring said paramedics, as well as other services, arrived on scene and found both vehicles in the middle of the road. Meiring said both vehicles had sustained a considerable amount of damage in the collision. Meiring said on closer inspection, it was found that ten people from the van and truck had sustained injuries ranging from minor to moderate. Meiring said paramedics began their treatment of the patients while Metro services closed of one of the lanes which caused heavy traffic delays. Meiring said once treated, paramedics transported the patients to various hospitals including Mediclinic Paarl. “The cause of the collision is not yet known Meiring added. A man in his 30’s was killed this evening after a bakkie rolled over him on a farm in Kameelfontein, North of Pretoria. ER24 paramedics had to battle the muddy roads of the farm to reach the patient. ER24 Spokesperson Werner Vermaak said once on scene, paramedics found a bakkie stuck in heavy mud in the middle of the dirt road. Vermaak said on closer inspection, paramedics found the body of a male patient stuck in the mud beneath the bakkie. Unfortunately the man had already succumbed to his severe injuries. Vermaak said it is believed that the man had stopped to assist in removing the bakkie from the mud. It is believe that, while pushing the bakkie, it began to roll back, trapping and crushing the man. “Local authorities were on scene for further investigations Vermaak added. Three people, including two children, were killed and three others injured this evening after a truck collided with a bakkie on the N12 in Westonaria in Carletonville. ER24 Spokesperson Russel Meiring said paramedics arrived on scene and found the two vehicles in the middle of the road. Both vehicles had sustained a large amount of damage. Meiring said three bodies of a woman in her 30’s, and two children aged 6 and 13 lay near the bakkie. Meiring said it was apparent that the three occupants had been ejected from the back of the bakkie during the collision. Meiring said unfortunately all the patients had succumbed to their severe injuries. Meiring said three occupants, a woman in her 30’s, boy aged 4 and girl aged 13, they were in the front of the bakkie were found sitting next to their vehicle on the side of the road. Meiring said it is believed that these occupants were pulled from the vehicle by bystanders. Meiring said all three patients sustained moderate injuries and were treated by paramedics on scene. Meiring said once treated, they were transported to Leratong Hospital for further treatment. Meiring said the cause of the collision is still under police investigation. At least 15 people were injured this morning after a head-on collision between a taxi and light motor vehicle on Deerlark Road in Tzaneen, Limpopo. ER24 Spokesperson Russel Meiring said when ER24 paramedics arrived on scene, they found 15 occupants from the taxi and light motor vehicle sitting around their wrecked vehicle which lay in the middle of the road. Meiring said on assessment, paramedics discovered that 15 people had sustained injuries ranging from minor to moderate. Paramedics set out treating the patients for their minor injuries. Meiring said once treated, all the patients were transported to provincial hospitals in the area for further treatment. The Western Cape Traffic Authorities this past weekend conducted 24 roadblocks of which 1 306 vehicles were stopped and 830 drivers were tested for alcohol. Provincial Traffic Chief Kenny Africa said last night in the Western Cape Province yet another 20 drunken drivers has been arrested. The highest reading recorded was 1.18mg per 1000ml and that was in the George region and the total amount of fines issued was R140 000. The highest speed recording was 102 kmph in an 80 zone on the N2 near Knysna 138 in a 100 zone on the N2 near Swellendam a 138 in an 120 zone on the N1 near Beaufort West. Meanwhile numerous fatalities have been recorded so over for the weekend. Provincial Traffic Chief Kenny Africa said yesterday there were four fatalities reported three pedestrians died in motor vehicle accidents.One in Citrusdal,on in Malmesbury and another one in Ligilethu west. “Since the start of this festive season a 108 fatalities have been reported which 52 was pedestrians, 28 passengers, 2 motor cyclist, 18 drivers and 2 cyclists Africa added. A woman in her 80s was killed and her daughter in her 60s critically injured this afternoon after their lost control and drove up an embankment on the R540 10 kilometres outside of Dullstroom in Mpumalanga. ER24 paramedics, along with fire services, arrived on scene and found the wrecked motor vehicle on the side of the road. Paramedics noticed that the vehicle had sustained a considerable amount of damage. ER24 Spokesperson Russel Meiring said on assessment, paramedics discovered that both woman were trapped inside the vehicle and were in a critical condition. Meiring said Paramedics and fire services carefully removed the two patients from the vehicle before treatment could be administered. Meiring said Paramedics assessed the patients and found that the mother had weak vital signs as well as multiple fractures and injuries. Meiring said during treatment, her vital signs deteriorated and CPR was initiated. Meiring said unfortunately, after 25 minutes of CPR, she succumbed to her injuries. 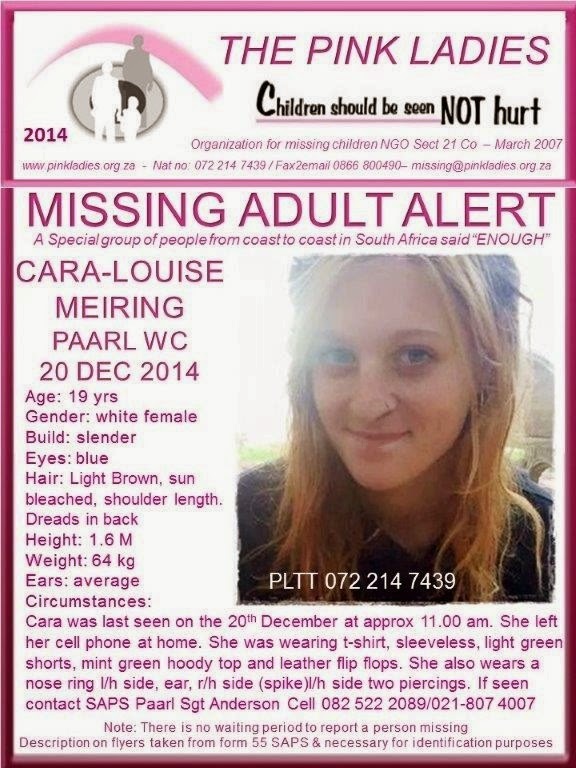 Meiring said the daughter was assessed and found to have sustained serious leg and chest injuries. Meiring said she was treated and transported to Mediclinic Nelspruit for further treatment. A twelve year old girl was found in a critical condition, partially trapped under a bakkie, late last night. It is understood that the vehicle was traveling on the R28 near Westonaria when it overturned several times, ejecting the twelve year old from the vehicle. ER24 Spokesperson Werner Vermaak said Paramedics from ER24 that arrived on the scene found the girl trapped under the overturned vehicle from her waist down. Vermaak said she was in a serious condition and presented with multiple injuries. Vermaak said Paramedics also found a man, believed to be the grandfather as well as another girl, still in the vehicle. Vermaak said they were rescued from the vehicle while the local fire department used specialised equipment to stabilise the vehicle and lift it from the twelve year old. Vermaak said a medical helicopter was called to the scene to assist with the trapped girl. Vermaak said once freed, she was airlifted to Chris Hani Baragwanath Hospital for further medical treatment. Vermaak said the grandfather and the other girl were treated and stabilised on the scene before they were transported to a nearby hospital for further treatment. Vermaak said both were in a stable condition. Vermaak said although the exact cause of the incident is not yet known, the grandfather explained that he swerved for a stationary vehicle in the road when he lost control. “Local authorities attended the incident Vermaak added. A family of four all sustained minor injuries while traveling from Glenharvie to Fochville on Greenspark Road. ER24 Spokesperson Werner Vermaak said a man, 35 years of age as well as his three daughters between the ages of three and thirteen were treated and transported by ER24 to Leslie Williams Hospital in Stilfontein. “The cause of the collision is not yet known but local authorities were on scene Vermaak added. Roads and houses in some parts of Cape Town have been damaged by flooding, the National Sea Rescue Institute said on Friday. NSRI spokesperson Craig Lambinon said Rough sea conditions during spring high tide in the early hours of this morning,caused some flood damage to some roads and reportedly also to some houses. Lambinon said a camping site at Silverstroomstrand also had to be evacuated. Lambinon said as well as this West Coast location, other areas affected by the flooding included Melkbosstrand, Milnerton, Hout Bay, Kleinbaai, part of Bloubergstrand, Derde Steen, Tweede Steen, Riebeekstrand and parts of Baden Powell Drive - on the False Bay Coast. Lambinon said certain roads in the areas have been closed temporarily for mop-up operations. Lambinon said Debris and sea sand washed onto the road." Lambinon said that bathers and boaters in Plettenberg Bay and Cape Columbine should be on high alert as rough weather was expected. Lambinon said that along the coast there would be high tides in the early evening. "Strong rip currents can be expected around the coast Lambinon added. A 31-year-old man is in a critical condition after his BMW collided with a lamppost and ripped in two on the N12 east near the Putfontein exit in Benoni. ER24 Werner Vermaak said Paramedics from ER24 that arrived on the scene shortly after 22:30 found the vehicle ripped into two pieces with the driver still trapped behind the steering wheel. Vermaak said Paramedics explained that he had to be cut from his safety belt and due to this, possibly prevented him from being ejected out of the vehicle during impact. Vermaak said once freed, they noticed that he was not breathing and immediately initiated advanced life support. Vermaak said he was stabilised on the scene and rushed off to Tambo Memorial Hospital for further medical treatment. It is believed that he sustained critical head injuries. “Although the exact cause of the incident is not yet known, it is believed that the driver might have lost control on the wet road resulting in his vehicle colliding with the lamppost Vermaak added. A taxi traveling on the N1 towards Polokwane was involved in a collision in which two people died just after the Hammanskraal off ramp. The collision allegedly occured when the two front tyres of the taxi burst, the driver alledgedly lost control and the taxi flipped into the oncoming traffic lane. ER24 Spokesperson Werner Vermaak said one person, a male, was ejected from the taxi and sustained fatal injuries. Vermaak said a female patient was declared dead when she reached the Jubilee Hospital in Hammanskraal. Vermaak said approximately eighteen other people sustained minor to moderate injuries including a small child of approximately two years old. Vermaak said Paramedics treated and transported the patients to various hospitals including Jubilee Hospital for further treatment. “Authorities were on scene for further investigation Vermaak added. An accident this morning on the N1 highway in Cape Town has left three people, including a two-year-old child dead and five others injured. Provincial Traffic Chief Kenny Africa said the accident happened just outside Sable Road from the N1 towards Cape Town, there is one single motor vehicle accident. Africa added that a driver lost control of his vehicle and collided with a lamp post on the side of street across from Canal Walk Shopping Centre. "A 27-year-old male, 22-year-old women and a two-year-old kid died in this accident." Africa said. The circumstances surrounding the accident will be investigated. ER24 paramedics responded to an accident scene late last night following a collision between a taxi and bakkie in Du Randt Road in Putfontein Benoni resulting in 17 people injured. Spokesperson Chitra Bodasing said they arrived on scene and found people lying on the road and in the veld. The taxi, with 16 occupants, and the bakkie, with one occupant, were in a head-on collision. Bodasing added that the taxi driver sustained multiple injuries. Paramedics treated him on scene and he was later airlifted to hospital. One of his passengers, also in a critical condition, was transported to hospital by ambulance. “it is understood the taxi driver and the passengers were ejected from the vehicle.” Bodasing said. An accident this morning left a man believed to be in his 30 s dead and multiple injured, after a collision involving three vehicles on Mandela Drive in Polokwane. ER24 Spokesperson Chitra Bodasing said they arrived on scene and found two cars on the side of the road and a taxi against a tree. “The driver of one car, was declared dead on the scene due to his multiple injuries. The passenger in this vehicle was found in a critical condition.” Bodasing added. She also said that the taxi driver was also in a critical condition. One person in the third vehicle involved sustained moderate injuries. Paramedics treated the injured patients and transported them to a nearby hospital for further medical care. A man believed to be a hijacker died in an accident involving a motor vehicle and a truck this morning,on the corner of the R553 and the R28 between Vanderbijlpark and Sebokeng. ER24 Spokesperson Chitra Bodasing said He allegedly hijacked a motor vehicle and injured the driver and then fled the scene with the alleged stolen car. While fleeing he collided with a truck and sustained fatal injuries. Bodasing added that the victim of the alleged hijacking sustained stab wounds and was transported by ER24 paramedics to Sebokeng Hospital for further treatment. Exact details to the cause of the collision will remain the subject of a police investigation. The Western Cape Department of Social Development is assisting in identifying some of the most vulnerable and poorest families in the province, to receive food packages donated by the Moonlight Humanitarian Policy Group Holdings. Minister Albert Fritz has requested the department, through regional offices, to assist in identifying the families and coordinate the logistics of delivering the food packages. Fritz added that this strengthens the partnerships between government and civil society organisations that also want to contribute towards the wellbeing of those less fortunate in a whole-of-society manner. He emphasised that the MHPGH donations will benefit just over 4 500 families in the Cape Town Metro region and surrounding areas, bringing some festive cheer to families facing dire economic challenges. “We call on all communities to lend a helping and charitable hand not only during the festive periods, but throughout the year.” Fritz said. The Democratic Alliance on Monday called on Basic Education Minister Angie Motshekga to announce interventions that will tackle inequality in our education system. This month, Motshekga announced Annual National Assessment, which showed that less than 3% of grade 9 pupils writing the 2014 tests achieved more than 50% for maths, but this was an improvement as only 2% of grade 9 pupils achieved 50% in 2012 and 2013. DA MP of Basic Education Annette Lovemore said in the past, many indicators have been used to measure the success of the schooling system, and that not one of them is linked to one of the biggest challenges in South Africa's schools. Lovemore added that one of the biggest problems that exists in South African education system today is the inequality in terms of education received by the poor and by the affluent. “The poor in our country are receiving a much in serious standards of education to those that are more affluent and can afford to pay fees.” Lovemore said. An accident this morning left three people dead and nine others seriously injured on the N1 outside Grasmere toll plaza. It is believed the driver of a bakkie, transporting the group, lost control of the vehicle. Netcare 911 Spokesperson Santi Steinmann said upon their arrival on scene they found a delivery vehicle had overturned resulting in three people tragically losing their lives. Nine people were found to have sustained injuries ranging from moderate to serious and after they were all treated on scene and they were transported to hospital for further medical care. In a separate accident involving two motor vehicles left a baby and three adults dead and three others critical injured on the R37 near Nelspruit. ER24 Spokesperson Pieter Rossouw said when they arrived on scene, they found extremely damaged vehicles on both sides of the road. “The two motor vehicles collided when one vehicle allegedly overtook another vehicle.” Rossouw added. He also said that one female required advanced life support and was later transported by ER24 paramedics to Rob Ferreira and The other patient, was also transported by ER24 to Mediclinic Nelspruit for further treatment. Nineteen police officers have been suspended for corruption and defeating the ends of justice from three different police stations in Limpopo. The officers were arrested on the 05th of this month and appeared in court where they were granted bail of between R1 000 to R10 000 each. The police officers allegedly accepted bribes and escorting illicit cigarettes. They are expected to appear in court in February 2015. Police Spokesperson Hangwani Mulaudzi said they have now been suspended without pay. “We are also busy with our internal processes to make sure that we fast track them and also to ascertain the fact that as the police we have the zero tolerance when it comes to corrupt activities within SAPS. We will do everything to make sure that these people have exited from the service.” Mulaudzi added. The Western Cape Traffic Authorities this past weekend conducted 22 roadblocks of which 2 300 vehicles were stopped and 1400 drivers were tested for alcohol. Provincial Traffic Chief Kenny Africa said 17 drunk drivers were arrested and the highest alcohol reading was recorded in Swellendam. “The total amount of fines that we issued was R400 440 and the highest speed recorded since Friday was 171km/h in a 120km/h on the N1 near Breckenfell. We also tested the speed of 11 457 vehicles of which we prosecuted 722 drivers for exceeding the speed limit,” Africa added. Meanwhile despite attempts to curb the amounts of road accidents and deaths over the festive season, more than 200 people have lost their lives across South Africa's roads. The death toll in the Western Cape this weekend alone sits at 29 following one of the biggest of the road accidents thus far for the season along the notorious stretch of N1 between Laingsburg and Beaufort-West on Sunday. The total fatalities as from the 1 December stands on 92. They consists of 43 pedestrians, 28 passengers, 2 cyclists, 6 motor cyclists and 13 drivers of motor vehicles. A man died and another injured after two vehicles collided head on with each other on Witkoppen Road in Bloubosrand. ER24 Spokesperson Werner Vermaak said it is understood that one of the vehicles veered into oncoming traffic, which resulted in the head on collision. When they arrived on the scene they found a man believed to be in late fifties trapped under the steering wheel of his vehicle. Local fire department had to use Local fire department had to use hydraulic rescue equipment to free the body from the wreckage. The Democratic Nursing Organisation of South Africa has reiterated its concerns regarding the shortage of health workers such as nurses as the road death continues to increase during the festive season. Denosa Spokesperson Sibongiseni Delihlazo said the situation at ICU facilities especially in rural areas during this time is dire, as the peak in the number of people to the ICU’s due to accidents. Delihlazo added that about 15% of nurses are based in rural areas whereas the population figure of the rural areas is around 44% in the country. “The picture changes completely during December whereby more people flock back to rural areas and that puts huge strain on the infrastructure that we have in those rural areas.